If you're handling grain, you need the DICKEY-john GAC2100 GI. 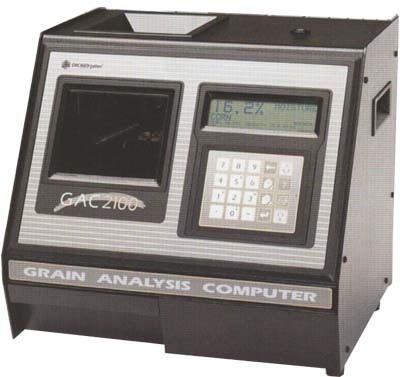 The GAC2100 GI is an economical, non-NTEP version of DICKEY-johns popular GAC2100 NB, which is used for officaial moisture measurement by USDA/FGIS, licensed FGIS agencies and most grain terminals and country elevators in the US. THE GAC2100 GI is as accurate as the GAC2100 NB, it can store up to 16 grain calibrations, and it delivers the widest grain and unit operating temperature ranges available in commercial moisture meters. Operating the GAC2100 GI is a simple matter of Selecting the desired product to test. Pouring the sample into the test hopper, Testing the sample, and Displaying the results. An easy-to-read LCD displays one-button prompts to quickly and easily step the user through the entire procedure, which takes just a few seconds start to finish. Two separate RS232 ports allow test results, by sample number, to be logged to a host computer and for sample tickets to be printed. The GAC2100 GI may be programmed to test sixteen different grains, and it may be operated in eight different languages.